Fujitsu Limited today announced the release of FUJITSU Business Application ATMS PMV, a new addition to its ATMS series of intellectual-property (IP) solutions that support companies in their overall IP-related activities. 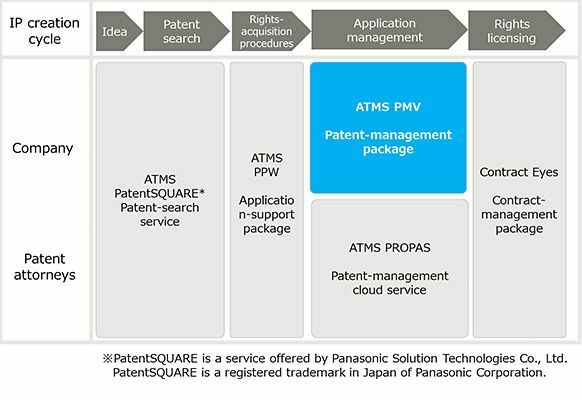 ATMS PMV, available in Japan September 20, 2016, is an IP-management package for patents, designs, and trademarks. With existing tools, patent-acquisition reviews and applications could only be processed one patent at a time. Now, with the new package, reviews and applications can be processed according to patent groupings by product or technology - which potentially contain multiple patents - making administrative processes more efficient. IP information can be further divided into specific subsets - for example, grouping patents under "liquid crystal" - for consolidated management. Functionality that visualizes the overall status of patents related to the specific subset and how the individual patents relate to one another supports the use of IP to contribute to business strategies, such as by helping companies determine whether to retain the rights of the IP they own. Fujitsu is positioning this package as a core solution for supporting IP administration, and is strengthening its sales activities accordingly. With the globalization of business in recent years, companies are filing patent applications in an increasing number of countries, bringing greater complexity to internal administrative processes, which include the decision making involved in acquiring patents in each country or retaining rights after the patent has been granted, as well as increased complexity in coordinating with outside partners, such as patent attorneys. As a result, there is a greater need than ever before to make these processes more efficient. In addition, in the face of a rapidly changing business environment, companies need to build overall IP strategies that are linked to their business and R&D strategies. To address these issues, Fujitsu is launching sales of ATMS PMV, the successor to its previous patent-management package, ATMS PM2000. The new offering makes administrative tasks, such as rights-acquisition applications for IP, more efficient, and strengthens support for using IP-management information to contribute to a company's business. With the consolidated workflow feature of ATMS PMV, reviews on the necessity of acquiring patents or retaining rights are performed in a single workflow for multiple patents, which can be grouped by product, technology, managing department, or patent family(1) . In addition to being able to process multiple patents in batches, whereas previously patents needed to be handled one by one, this feature enables users to grasp the overall status of patents included in each group, thereby helping to prevent procedural oversights and other errors, and making operations more efficient. Also, the consolidated workflow function automatically categorizes patents according to pre-defined groups, and flows can be split or consolidated in different ways as required, enabling flexibility in setting the group to be reviewed in accordance with different work scenarios. ATMS PMV can connect to the patent-management cloud service ATMS PROPAS (figure 1), which lets companies synchronize and share data with patent attorneys, local patent agents, and other outside partners as part of the patent-management process. For the company and its outside partners, this makes the system-registration process for patent-management data more efficient and speeds up procedures in general. JPY 1.5 billion by March 31, 2019. Patents filed in multiple countries based on the same invention, and sets of related patents.